Apparently, the female stereotype works here. This is clearly confirmed by the Kawaii Wolffie skin, designed specifically for very bright young ladies. Of course, this is super far from an elegant komtum or dress. But it throws a challenge. Now let’s see who in minecraft PE will become your ally. It is good that Minecraft PE 0.14.0 / 0.14.1 / 0.14.2 / 0.14.3 is not like in real life. Here you can walk in revealing outfits at least at night. Nothing will happen to you. It is interesting to visit some more image? 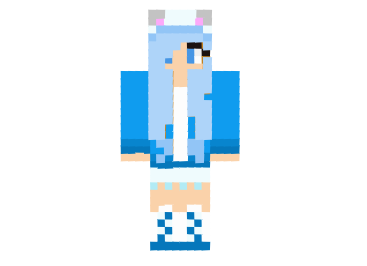 We suggest that you download the Kawaii Wolffie skin and try, try, try, until you find yours. If the skin has gone, then you can even think about some other addition. Just do not forget about the blocklauncher, because it can then save from an overdose. In general, we play!